PHOTO BY JILL GOSCHE Old Fort's Weston Miller is guarded by Hopewell-Loudon's Jake Simonis (left) and Jordyn Jury during the game in Bascom Saturday. BASCOM — It was going to be showdown time in the Sandusky Bay Conference River Division Friday night, but the daytime wintry blast wiped out games featuring Old Fort at Sandusky St. Mary and New Riegel at Fremont St. Joseph. The four clubs shared the division lead coming in with 3-1 marks, so something was going to give. Those battles are left for another day, but for Old Fort, it wasn’t a totally lost weekend. The Stockaders put together a special defensive effort and handed Hopewell-Loudon its first home loss of the season, 55-42, Saturday night. 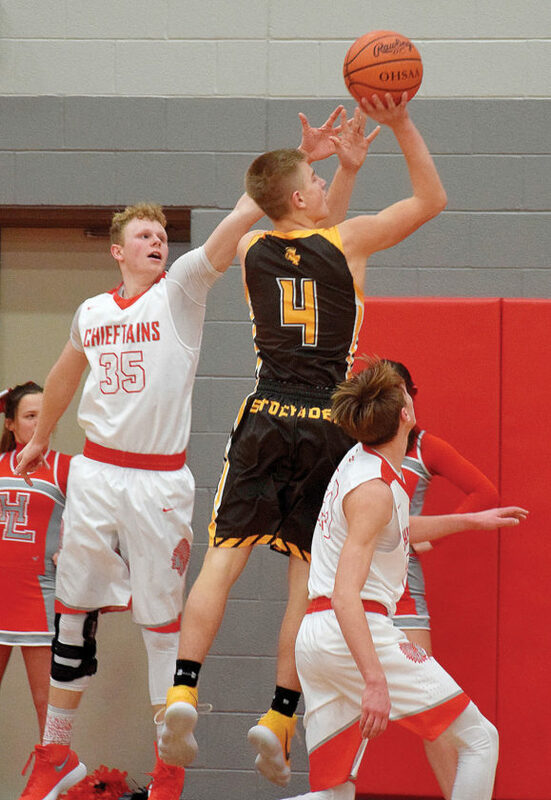 “I felt pretty fortunate that the teams are similar,” Old Fort coach Eric Hoover said of weekend foes after his club improved to 6-5 while dropping the Chieftains to 7-4. Luke Wagner and AJ Steyer each scored five points and Jacob Webb added four in the first period as Old Fort opened a 16-6 lead and had the Chieftains playing catch-up the rest of the night. But it was at the defensive end where Old Fort laid its foundation. The Chieftains were limited to 14 of 45 from the field and they had an uncharacteristic 17 turnovers to go with that. “I felt like we made things difficult for them,” Hoover said. “It wasn’t our normal pressing style game. We just wanted to contain them and keep everything in front of us. We didn’t want to go run traps all over and gamble too much. A little help came at the Hopewell-Loudon end. The Chieftains’ struggle in shooting extended to the foul line as well, where the host club managed just 8 of 20. Jake Simonis kept Hopewell-Loudon in the hunt in the first half. He had all six first-period points, and had 14 on the board by halftime, which came with Old Fort owning a 25-21 edge. He finished with 19 points to lead all scorers. Three times, the Chieftains pulled to within one point in the third period, the last occasion coming on Jordyn Jury’s only field goal of the night to make it 28-27 with 4:06 left. But Webb, who led Old Fort with 18 points, hit a couple jumpers, made a pair of foul shots, and zipped a pass to Wagner, whose 3-pointer with 10 seconds left gave the Stockaders a 37-30 edge heading to the fourth. Travis Milligan, who scored eight of his 11 total points in the fourth period, hit two foul shots to open the period. But Old Fort pushed the margin to 11 with a burst that featured Carson Steyer inside and Webb on the perimeter. All but four of Old Fort’s total came from four players as Wagner and Carson Steyer scored 12 and AJ Steyer checked in with nine. “Probably the two worst things we did defensively was to fall asleep on a couple of out-of-bounds plays and gave them a couple of layups,” Jury said. “We’re never mad at them for missing shots, we’re more mad about execution. After Milligan, the H-L scoring dropped down to five by Luke Bolte. Jordyn Jury had four, 13 off his season average.